It’s that time again, already! 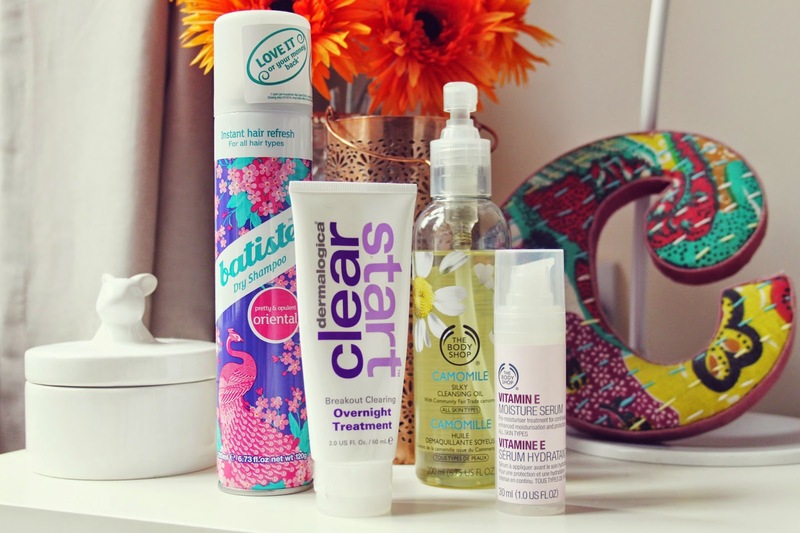 September has been a good month for me in terms of new products, as there have been so many I’ve tried out and loved, along with some old favourites too! I’ve been on a bit of a mission with my skin over the past month as I’ve found that I’ve had a lot of breakouts and my usual products haven’t been cutting it, so there’s a few new skincare favourites thrown in too for good measure. Let’s get cracking!! Batiste ‘Oriental’ Dry Shampoo – You all know I’m a big fan of dry shampoo, particularly since I turned to the bleach! It’s such a staple product in my collection and I’m never without a bottle. It’s a quick pick me up when my hair is lacking in volume or if I’ve woken up too late and need to freshen it up quickly. I think this is a new scent as I’ve never seen it before, and it might just be my favourite one yet! Dermalogica Clear Start Overnight Treatment – This is something I picked up on a whim whilst in my local nail salon after hearing a couple of Youtubers rave about it, and I’m really enjoying using it. For me the results aren’t as dramatic as I would have hoped, but I definitely notice a difference to my skin when I’ve put a layer of this on at night. The next morning, spots and redness are reduced and the overall texture of my skin feels much better. Not a miracle worker but it really does help! The Body Shop Camomile Silky Cleansing Oil – I picked this up recently at a Blogger event at my local Body Shop. I went with the intention of restocking my Cleansing Butter from the same range, but instead came away with this oil version on the recommendation from a few friends. This is a gorgeous cleanser that I use for removing my make up before a second cleanse with another product. 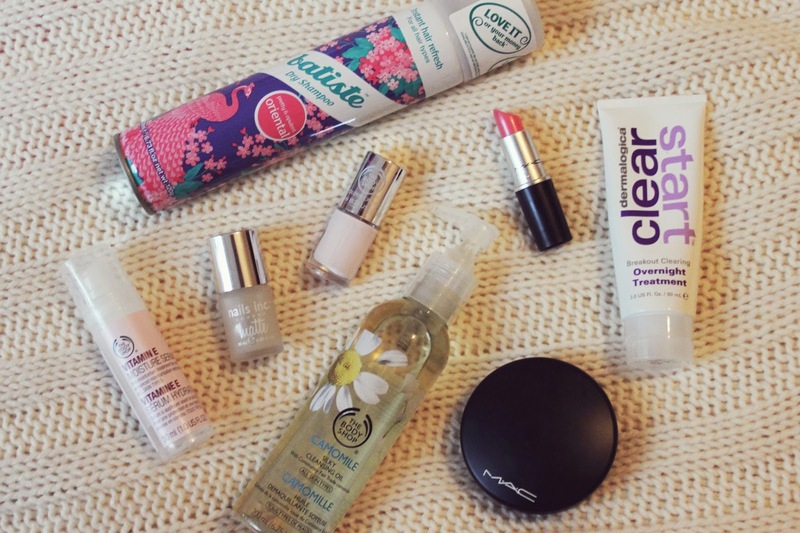 It’s gentle on the eyes and is really easy to use, getting rid of every last ounce of make up in next to no time at all! The Body Shop Vitamin E Moisture Serum – Another item I picked up at the event after wanting to dip my toes in the world of serums. This is a really lovely lightweight serum that has helped pump some moisture back in to my skin. The Body Shop Colour Crush Nail Colour in Frosting Fancy – Yet another item I picked up from the Body Shop event, and the main reason I went along in the first place! They have recently launched a range of gorgeous nail polishes in some really lovely colours, and this one caught my eye. It’s a really lovely milky shade with just a teeny touch of pink, and it’s been on my nails pretty much the whole of the month! Nails Inc Matte Top Coat in Westminster Bridge – I’ve been wearing this over Frosting Fancy for a really sleek matte finish. This was in my September Glossybox and was hands down my favourite product from it! I can’t wait to wear this over black, navy and plum polishes this season, too. MAC Mineralise Skin Finish Natural in Medium – My absolute holy grail setting powder, as I’m sure long time followers will know! 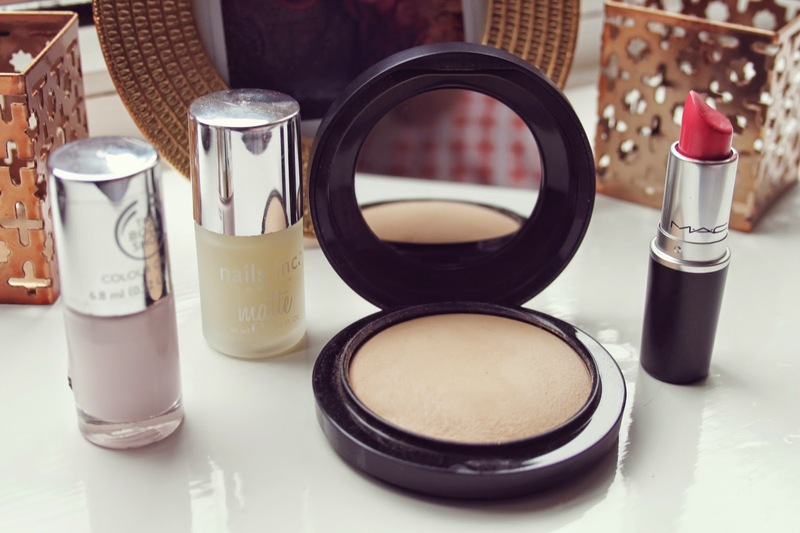 It’s been out of my make up collection for far too long, as I just couldn’t bring myself to splash out on it when there are so many powders available for a heck of a lot less. It was my birthday in September though, so I asked for this and Dan delivered! It’s only when you’ve been without it so long that you realise just how good it is. I think this may be my fourth or fifth pan! MAC Lipstick in Sunny Seoul – Another birthday treat from Dan, this gorgeous peachy pink lipstick from MAC! I swatched this one when we were in York back in July and fell in love with it straight away. It comes off a little paler than it looks in the bullet, and it’s such a pretty shade. I’ve worn this every day since I got it and I think it’s now a firm favourite in my (ridiculously large) lipstick collection! What have you all been loving over the last month? Share your Favourites posts in the comments below! I'm really sorry to say that, but I can't read anything in this post, the letters are so small. Thank you for letting me know. I've not had any problems with this before. How strange! What browser are you viewing in?